Any die-hard Olympics fan knows that there’s more to any broadcast than just the competition itself. Between the runs, routines, or periods, audiences are invited into athletes’ individual stories in warm and fuzzy human-interest packages. Because like in the case of British ski-jumper Eddie “The Eagle” Edwards, the Olympic Games are the destination, not the whole journey. In very special cases, the journey is heartwarming enough to earn the full feature biopic treatment. Eddie The Eagle, which hits theaters on Feb 26, stars Kingsman: The Secret Service actor Taron Egerton as Edwards and Hugh Jackman as his coach Bronson Peary and follows the unlikely hopeful’s offbeat road to the 1988 Calgary Olympics. Egerton channels Edwards in the film, sporting the thick-lensed glasses that the competitor became known for. Continue reading to compare Egerton’s film look to these 11 photos of the real Eddie “The Eagle,” from his unconventional rise to fame in the ‘80s to the present day. Edwards qualified for the Games not by pure talent, but on a technicality. As the only British ski-jumper seeking the opportunity to compete on the world stage, Edwards snagged a spot. Along with it, he snagged the optimistic and — to some degree, dubious — interest of his home country and beyond. The public loves an underdog story, and Eddie “The Eagle” Edwards represents the ultimate underdog. Here's Edwards flying high in competition at Calgary. He competed in the 70m and 90m ski-jump events. Edwards' unique situation made him a media darling during the Calgary games. Here, the press gathers around the ski-jumper like he's a kindergarten teacher and it's story time. Edwards grew up in Gloucestershire before becoming Great Britain's first entry into the ski-jump event. According to BBC News, he's back living in his hometown today. Luckily, Edwards didn't endure any serious injuries during his Olympics experience. But his determination saw him through hardships during training. 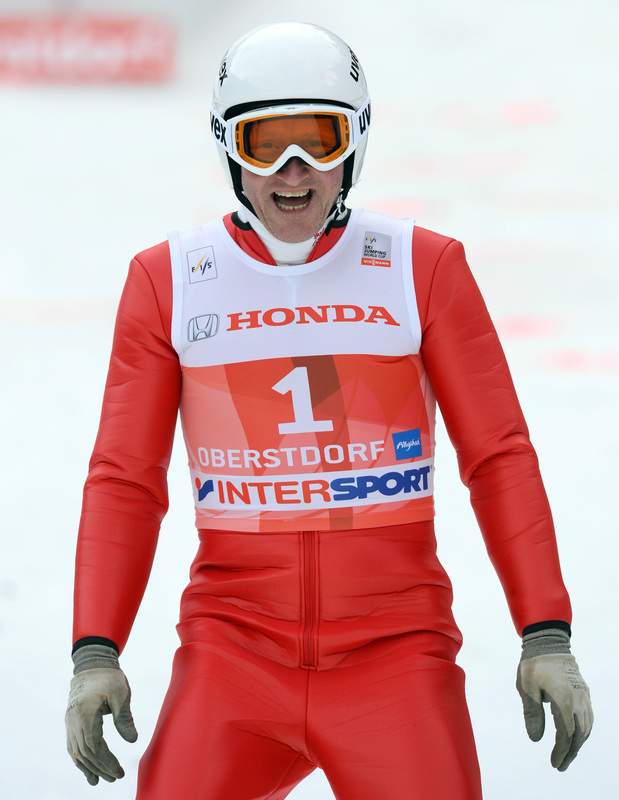 Edwards holds his arms up in victory after completing a jump during competition. Edwards linked arms with Jackman, Egerton, and Eddie The Eagle director Dexter Fletcher in this on-set shot featured on Jackman's own Instagram. Edwards can often be found making public appearances, and has hit the slopes again for causes like Ski For Cancer. Despite his relative lack of funding and physical disadvantages, Edwards refused to give up on his dream. An offshoot of the UK charity drive Comic Relief, Sport Relief counts Edwards among its celebrity supporters. 10. Eddie, Don't Lose The Glasses! Edwards got LASIK surgery? Say it ain't so! Spoiler alert for Eddie The Eagle: winning isn't the end-all, be-all of athletic competition. Edwards became an icon because he represents athletes who weren't blessed with perfect genes, natural skill, or unlimited trust fund, but who put themselves out there anyway. It's impossible not to be inspired by this guy.